Stock chart triangle patterns are classic setups for great option trades because they identify the consolidating price action that usually precedes a breakout. It is this breakout that we are interested in because it signals the beginning of a strong directional move where we can use options to leverage our potential profits. Another strategy that can be used on conjunction with triangle patterns is the straddle - an equal number of both call and put options on the same security with a longer term to expiration. For these types of trades, we are not interested in the breakout but the period just prior to it. Around this time, the stock price is going nowhere and consequently, option implied volatility (IV) should be relatively low. Once the breakout occurs, IV can explode and as the stock moves, either the calls or puts (but not both) will not only be in-the-money, but the option prices will be inflated to such an extent that the winning side pays for the losing side and then some. 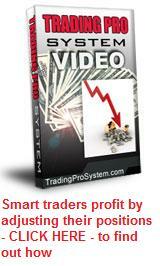 This pattern occurs when you have converging support and resistance lines. Extending the lines will form a peak and hence, the triangle pattern. The symmetrical triangle is a sideways pattern which is usually formed over between 20 to 50 days. We do not trade directionally within this pattern because the price action is being compressed and the volatility is going out of the stock. Volume should also be decreasing as the buyers and sellers can't make a decision. It is quite common for the stock to break out during the final one-third of the pattern and this is the ideal time to enter your straddle position if that's your strategy and the price is right. If we are planning on trading the breakout as a directional play, something to remember is that the likely direction of the breakout is usually in the direction of the medium term trend. Once the breakout occurs, we enter the trade. The thing about triangle patterns is, that you can also use them to predict the potential target price of the underlying. This means you may be able to hold onto your options positions until it reaches the target, or close to it. You could go long the options in whichever direction the price breaks out, or you could choose a credit spread that relies on the price to stay away from the opposite direction in order to profit. The ascending triangle heralds a potential upward thrust in price action once a breakout occurs. 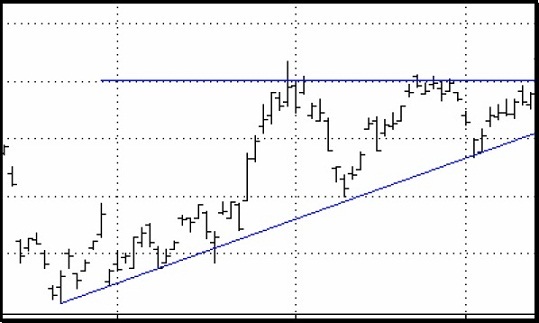 It has an horizontal resistance line together with an ascending line of support drawn under the troughs on your chart. Again, this pattern is normally formed over 20 to 50 days and we wait until the breakout is confirmed before we enter a trade. In my experience, ascending triangles have the greatest probability of breaking down in the opposite direction rather than breaking upwards, because the resistance line can sometimes prove to be too strong. As the price action nears the apex of the triangle it is being compressed and should not be traded. But once the security breaks out of the triangle and does so following an already established upwards trendline, the probability of the stock continuing north is high and therefore ripe for entering call options positions or using put option credit spreads. If you take a look at the chart below, you'll also observe that sometimes the stock can retest the resistance line (which now becomes support) after it has broken through it. 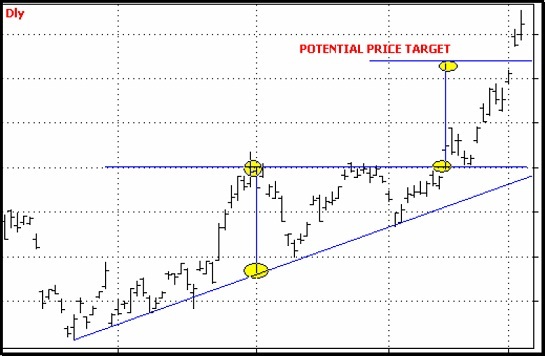 As with the symmetric triangle, we can also use the ascending triangle to anticipate a target price for the underlying. I have found this to be one of the most reliable and profitable of the triangle patterns, to trade. Once the underlying breaks downwards from the descending triangle, the subsequent fall can be quite dramatic - and profitable - if you're long put options. As with the symmetric and ascending patterns, we look for one formed over 20 to 50 days and prepare for the breakout. 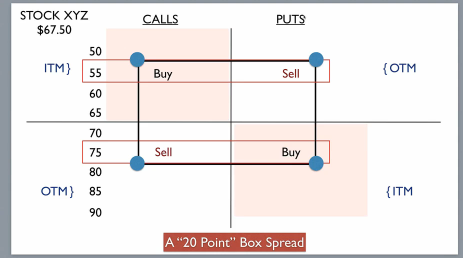 Once the breakout is confirmed, we can either take out a debit put option position or spread, or if we want a less profitable but more sure thing, use a call option credit spread instead. 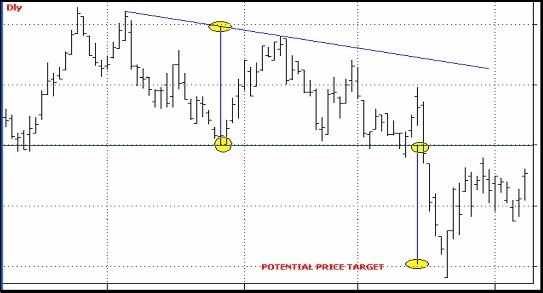 Triangle patterns should NEVER be used for range trading strategies such as iron condors or calendar spreads.